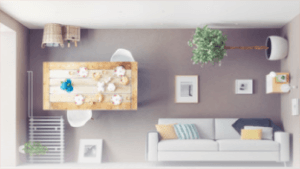 Can a technologically advanced ‘smart home’ fitted with IT systems and appliances be enhanced even more simply by crafting a flexible, adaptable layout? UNStudio employed what they call ‘centrifugal circulation’ to form the basis of the WIND House in North Holland, augmenting high-tech features with an overall shape that calls to mind the blades of a fan. Inspired by a flower, the four facades of the home curve toward the inside to create distinct petal-like wings, drawing the landscape into the center of the home. These recesses create indoor/outdoor spaces that visually connect the different parts of the home to each other via glazed walls. An open staircase forms a ‘circulation core’ between the four recesses, connecting the front and back wings and leading all the way from the basement carport to a fenced rooftop terrace. All of the angles of the home are formulated to take advantage of views, sunlight and the southwest wind for optimal energy efficiency. The flexible floor plan enables the various rooms of the home to be used however the occupants please, so it can grow and change along with their family and needs. Smart features include a comprehensive automation system with solar panels, a central touch-screen and the option to connect to the home’s controls remotely via wi-fi.